There are a lot of weirdness in the quantum physics world. So much weirdness that quantum physics actually refers to some phenomena as quantum weirdness. And believe me, it lives up to it’s name. One example of very weird behavior is the wave-particle duality of light. The wave-particle duality is an explanation for how light behaves. Basically, it says that under certain circumstances, light is a particle. Under other circumstances, it behaves like a wave. Specifically, there is one experiment that is the “classic” case of demonstrating the apparent shift back and forth between the states called the double-slit experiment. The reason this topic gets attention is because of the outcome. Scientists expect electrons being shot through a double slit to behave like a particle — producing only two lines on a screen, but it behaves as a wave, producing a pattern of lines. The current consensus explanation is that light can shift between particles and waves depending on the scenario. However, there is an alternative! The Pilot Wave Theory of light provides an excellent explanation for this experiment. It is also highly intuitive. Basically, it states that light does not shift between particle and wave, it is both at the same time. It is basically light particles riding on light waves, like surfers riding on ocean waves. This theory has a lot of traction in physics circles, but tragically is not accepted by mainstream science. This theory accurately explains the outcome of the double-slit experiment and challenges firmly held beliefs about the nature of light. Let’s zoom out here, and see exactly what the double-slit experiment is. The double slit experiment starts with the single-slit experiment. The single-slit experiment is basically setting up a particle beam that shoots either photons (small particles of light) or electrons through a slit in some kind of shield. The media shot through this is then observed on the other side. The single-slit experiment produces results that we expect. A beam of light goes through a slit and produces a single strip of light on the other side. Like the illustration shows, the single-slit experiment produces the expected result. This is how light acts as a particle. It travels straight through and produces a strip of light on the screen. Nothing really strange here at all, eh? But things get strange when another slit is added to the slit partition. The double-slit experiment produces an interference pattern of light, similar to how a wave would behave. Didn’t see that one coming, did ya? Well neither did a lot of scientists. However, when we now view light as a wave, the reason this happens is pretty clear. The waves are stacking on one another and producing an interference pattern on the screen. Essentially, waves of light are constructively and destructively interfering as they travel towards the screen, and producing the pattern of light and dark fringes. View the illustration below to see a visual of this. So what is the confusion exactly? Well, the confusion lies in the fact that the particles being collected on the back screen are behaving like waves. Remember in the beginning of the article when I talked about how the particles are collected on the back screen? Take a look at what they look like. Strange! So it appears as though the light/electrons do in fact behave like both particles and waves. The particles are going through the slits, but they are distributed exactly like waves would be. But the current explanation is…they change between the two? The alternative explanation to the wave-particle duality is to model the light particles as moving on waves. This is referred to as Pilot Wave Theory. This way, we don’t have to believe that light somehow flips between one state and another in a logic-defying way. Take a look at the animation below of the double-slit experiment. It accurately depicts a discrete light particle riding a light wave to it’s destination: one of the interference patterns bars on the back collection screen. This animation from PBS Digital Studios provides a visual of the Pilot Wave theory. Light particles “ride” the waves of light, instead of transforming into them. The particle takes a specific trajectory (based on classical wave mechanics) and hits the screen as expected. Where is this theory from? A man name Louis de Broglie formulated this theory in the early 20th century. He modeled the light waves using the Schrödinger equation. [For information regarding the origin of the Schrödinger equation, please read this article]. However, his idea was ultimately rejected at the Solvay Conference. Mainstream academia’s strict adherence to Einstein’s general relativity and special relativity do not allow for light particles to travel on “guiding waves” as de Broglie describes. However, the elegance and brilliance of pilot wave theory has maintained many followers since it’s inception, and has lead many to abandon Einstein’s theories altogether in favor of de Broglie’s. 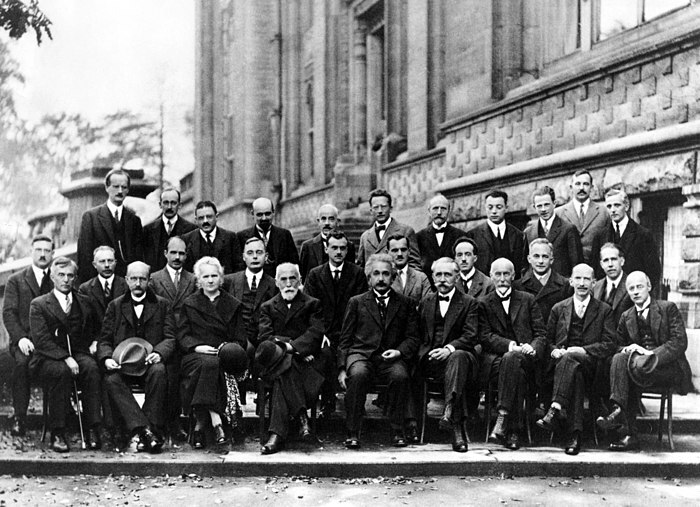 Einstein’s (fifth from right, bottom row) relativity theory overcast de Broglie’s pilot wave theory (third from right, middle row) at the 1927 Solvay Conference in Copenhagen, Denmark. 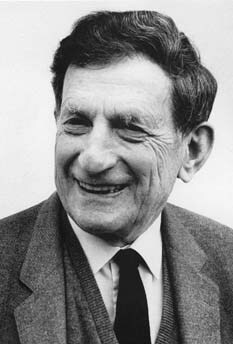 One person who pushed Pilot Wave Theory to a new height was David Bohm. David Bohm completed the Pilot Wave Theory. In fact, it was even renamed after his work in the 1950s, giving it it’s current name: de Broglie-Bohm Pilot Wave Theory. There is a PBS Space Time publication that does an excellent job explaining the history of Pilot Wave Theory, and provides the back story of it’s formulation. In a nutshell, a scientist name Louis de Broglie came up with the theory in the early 20th century. His idea was rejected in Copenhagen quantum meetings, however. Other contemporary quantum leaders such as Neils Bohr and Werner Heisenberg were adamant about rejecting “classical” physics in their interpretation of quantum phenomena. Maybe they threw out the baby with the bathwater, though. but was revived by David Bohm in the 1950s. Analogous experiments that show Pilot Wave behavior can be reproduced at a human scale. Physicists like Yves Couder use silicon droplets bouncing on oil to demonstrate the particle-wave interaction. The particle bounces up and down, and generates a wave that pushes it. Below is a real example of silicon droplets in a double-slit experiment. The appeal of Pilot Wave Theory is that it does not stray far away from classical physics—let alone throw it away like Einstein’s quantum theory. Scientists such as Yves Couder demonstrate the same double slit behavior with silicon particles visible to the naked eye. As you can see in the footage (not an animation! ), the bouncing silicon droplet picks a discrete trajectory. Staunch physicists may say “the quantum world does not behave like the human scale world.” But this kind of thinking is a hindrance to progress. After all, why shouldn’t it? Why do we need to weave stories about light particles transforming into waves when more intuitive (or perhaps even obvious) explanations exist? I will leave that up to the reader to decide. Pilot Wave Theory is an elegant solution to the wave-particle duality problem. Instead of making mystical demands of scientists, and making ridiculous claims about wave particle transmutations, it gives an intuitive explanation for the double-slit experiment. The main reason it is rejected is due to political ignorance and orthodoxy surrounding Einstein’s flawed general relativity and special relativity doctrines. However, the theory has gained traction in circles mainly outside academia ever since it’s inception. Please investigate the theory for yourself and leave a comment with any errors or suggestions. In a nutshell, Pilot Wave Theory suggests that light particles travel in discrete paths as particles, guided by waves. Why don’t more physicists subscribe to pilot wave theory? Bush, John. (2015). Pilot-Wave Hydrodynamics. Annual Review of Fluid Mechanics. 47. 269-292. 10.1146/annurev-fluid-010814-014506. English: Results of a double-slit-experiment performed by Dr. Tonomura showing the build-up of an interference pattern of single electrons. Numbers of electrons are 11 (a), 200 (b), 6000 (c), 40000 (d), 140000 (e).